Diffusion-ordered spectroscopy (DOSY) seeks to separate the NMR signals of different species according to their diffusion coefficient. A series of spin echo spectra is measured with different pulsed field gradient strengths, and the signal decays are analysed to extract a set of diffusion coefficients with which to synthesise the diffusion domain of a DOSY spectrum. 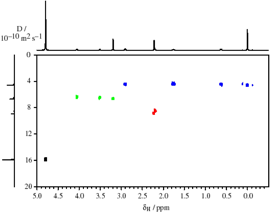 (Left) array of 1H PFGSTE spectra measured with linearly increasing field gradient, for a mixture containing TSP, choline and acetone in D2O, and (right) the resultant DOSY spectrum, showing TSP signals in blue, choline in green and acetone in red. In 2D DOSY the initial diffusion-weighted spectra are one-dimensional; adding diffusion weighting to 2D experiments such as COSY, NOESY or HMQC gives 3D DOSY spectra. DOSY can be roughly subdivided into two areas: low resolution DOSY of simple mixtures of molecules with widely differing sizes and poorly resolved NMR spectra, and high resolution DOSY, of more complex mixtures which may contain molecules of very similar sizes but which give well-resolved NMR spectra. The difficulty of extracting clean diffusion parameters from overlapping signal decays sets strict limits on the diffusion resolution of low resolution DOSY, but in the high resolution case relatively small differences (of the order of 1%) in diffusion coefficient can be resolved. To identify such small differences reliably it is necessary that the systematic errors be reduced to an absolute minimum: the challenge of designing successful high resolution DOSY techniques is to combine experimental methods which minimise such errors with data analysis procedures which compensate as accurately as possible for the errors that remain. Most recently we have been investigating the potential of pure shift methods, in which the efffects of scalar couplings are suppressed so that the multiplet structure normally encountered in proton NMR is collapsed, to provide a major improvement in the resolution of proton DOSY experiments (Chemical Communications designated this a "hot paper"). Other recent developments include a variety of uses of multivariate statistics to enhance the chemical information obtainable with DOSY, and the use of matrix-assisted DOSY methods to improve diffusion resolution, for example allowing the resolution of the NMR spectra of isomers. Barjat, H, Morris GA, Smart S, Swanson AG, Williams SCR. 1995. HIGH-RESOLUTION DIFFUSION-ORDERED 2D SPECTROSCOPY (HR-DOSY) - A NEW TOOL FOR THE ANALYSIS OF COMPLEX-MIXTURES. Journal of Magnetic Resonance Series B. 108:170-172. Morris, GA. 2009. Diffusion-Ordered Spectroscopy. Encyclopedia of Magnetic Resonance. DOI: 10.1002/9780470034590.emrstm0119.pub2.